Fantastic 3-side brick home in coveted WoodCreek. 4700+sf of finished space nestled in a cul-de-sac. Welcoming porch leads to 2-story Foyer flanked by Office & Dining Room. Family Room opens to Breakfast Room & huge, well-appointed Kitchen. Spacious Owner&apos;s Suite with spa-style bath: heated floors, dual vanities with leathered stone countertops, LED lit mirrors, soaking tub, frameless shower. Back stairs lead to Bonus Room with buit-in workstations, 1 Suite, & 2 BRs sharing Bath. Terrace Level with smooth ceilings comprised of BR, Bath, & Home Theatre (equipment and built-in cabinet remain.) Storage abounds. 3-Car garage plus shed for golf cart/lawn equipment. Private backyard. Active HOA. 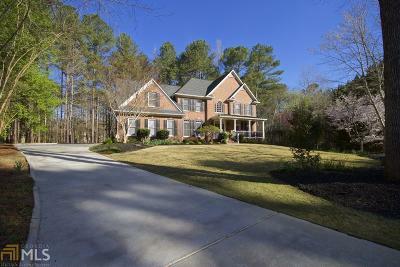 Desirable Starr&apos;s Mill Schools. Access to PTC paths. Directions: From Highway 74: Turn North On Redwine Road. Turn Right On Wood Creek Lane. Turn Left On Oakshadow Way. Turn Left On Hemlock Ct.